St. Stephen’s offers worship opportunities with the Lord’s Supper served each and every Sunday during the year. During our “Program Year,” which runs roughly from Labor Day until Memorial Day, our Sunday services take place at 8:30 and 10:30 am. We are currently in the 2018/2019 program year. Please check the weekly calendar for any changes to the regular worship schedule on festival Sundays such as Palm Sunday, Pentecost, or Reformation. 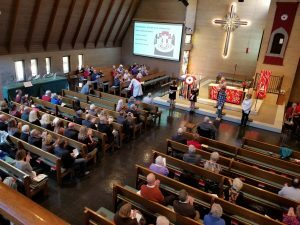 Our 8:30 and 10:30 worship opportunities each follow a fairly consistent liturgical pattern of Gathering, Word, Meal and Dismissal, often following the forms suggested by the ELW (Evangelical Lutheran Worship) hymnal or other liturgical resources. Scripture readings usually include an Old Testament Lesson, a sung Psalm, a New Testament Lesson, and a reading from one of the four Gospels, following the schedule of the Revised Common Lectionary (RCL). Worshipers will find liturgical songs and hymns of a wide variety of styles representing centuries of Christian music from chant to German-style chorales, popular American folk and spiritual songs, Christian music with global and ecumenical roots, as well as the modern praise style refrains. Printed bulletins are used alongside screens to help guide worshipers through the service, inviting everyone from the most regular attender to the first-time visitor to participate in prayer and song throughout. Our 8:30 Worship is accompanied most often by organ and piano, with a choir and cantor support congregational singing, while our 10:30 Worship often leans toward more contemporary musical styles. Communion is served as part of every service, and we invite everyone to come to the table to receive the Lord’s Supper.